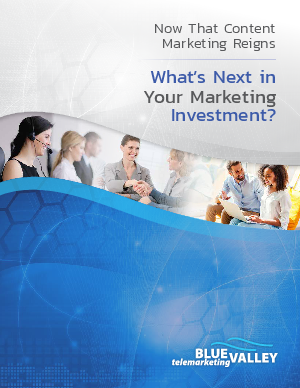 > Blue Valley Telemarketing > Now That Content Marketing Reigns...What’s Next in Your Marketing Investment? The development of a reliable and measurable marketing plan is the foundation for growth in a company. For many B2B marketing directors, the challenge is execution. Too often a plan is not prioritized and is left untouched for weeks or months. Effective execution of a marketing plan requires daily interaction with objectives and strategies. Using an integrated approach to deliver the brand message to the right audience at the right time is key to success. This white paper focuses on one element of the marketing plan: content marketing. It covers what should go into a high-functioning content marketing strategy. It will also discuss identifying the target audience, the needs of the audience and how the content is distributed to the audience.